Jack is desperate for a dog, but his bossy older sisters want a cat. Jack thinks a big, black dog called Fangs would scare off the bullies who pick on him. But he has to settle for a pup from a neighbour and when it gets picked on, Jack shows his strength and bravery and stands up for it. 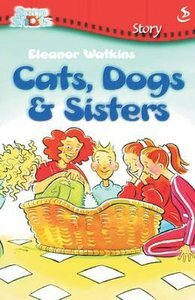 About "Cats, Dogs & Sisters (Snapshot Series)"